Australian Kids Clothing eBay Store Design Pops! According to the Australian Bureau of Statistics there were 309,582 births registered in Australia in 2012. That’s a lot of little ones who are going to need wardrobes. Internationally-based Baby and Kids Clothes Australia offers the internet’s most unique collection of wares for your little guy or gal. To make themselves more accessible to their overseas clients, they commissioned the experts at OC Designs Online to craft them a custom eBay Store Design. Now they ship orders internationally on a daily basis. Take a look at this fun, whimsical design! A colorful and highly playful illustration characterizes the eBay Shop Design and company branding. The custom search bar is contained within a green flag gently swaying in the digital breeze. Between bolts of color and aircraft such as hot air balloons and rockets, a main navigation bar hosts tabs for shipping policies, payment options, FAQs, and contact information, while a fitting Baby & Kids logo breaks up the space. Popular categories can be accessed one of two ways. First, by visiting the eight vertical links in the left sidebar. Next, the four most popular categories appear catercorner, drawing folks in with a baby dinosaur representing the first category, and followed by baby girls, men’s and women’s options. A welcome message is underscored with the store’s target audience- a newborn cutie among piles of cushy baby clothes. A green and orange accented invitation to join the company’s newsletter means devoted parents, doting grandparents and involved aunts can receive exclusive emails about new items and special promotions for the little one in their life. In the eBay Template‘s midsection, a section of featured categories maximize listings for some of the shop’s top sellers. These can easily be changed out based on season or to emphasize sale merchandise. Our design experts utilize four effective graphics to remind shoppers of Baby & Kids free shipping policy and team of 24-hour response team. 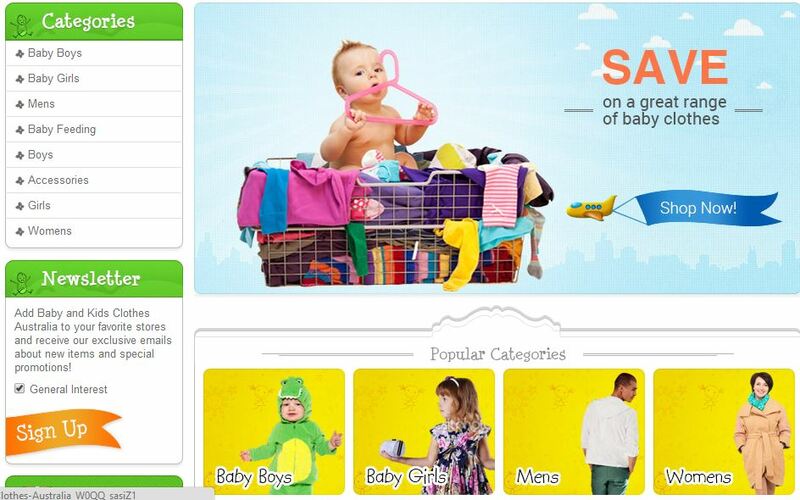 Finally, a bright green banner repeats the Baby & Kids logo to emphasize branding and closes this custom eBay Store Design. Whether you are “Down Under” like Baby and Kids Clothes Australia or have a U.S. based eBay store, OC Designs Online can create the perfect design for you, too! Please browse our impressive portfolio of inspired eBay Shop Designs and request a free quote to learn more. Don’t forget to look us up on Facebook, follow us on Twitter and check us out on Google+.